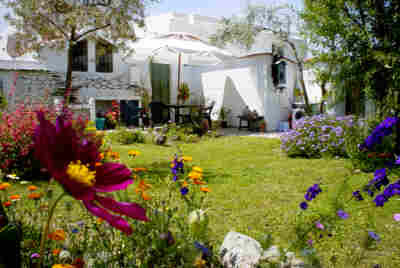 El Nido - holiday cottage with pool in Orgiva, Spain. Pets welcome. 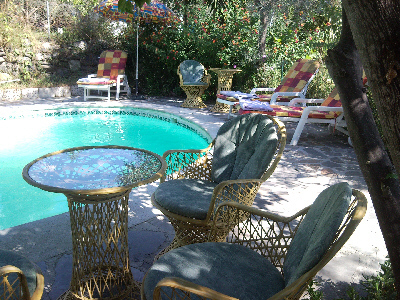 Peaceful holiday cottage with private pool, close to Orgiva. Now taking bookings for 2018. Good internet access and pet friendly. EL NIDO means "The Nest". It is a perfect place to curl up and forget about the world and its cares. A few minutes walk from ORGIVA, with its shops, bars and restaurants. El Nido lies in the beautiful and peaceful valley of the Rio Chico. The pool is fenced off from the garden for safety. Direct flights to Granada and Malaga. Less than an hour from Granada airport to El Nido. Full internet access installed at no extra charge. Air conditioning/heating throughout the cottage. El Nido is situated amidst stone walled orchards of oranges and olives. Starting from the ruins of an ancient stone farm a local architect and interior designer created this delightful holiday home in a traditional style, with modern comforts. 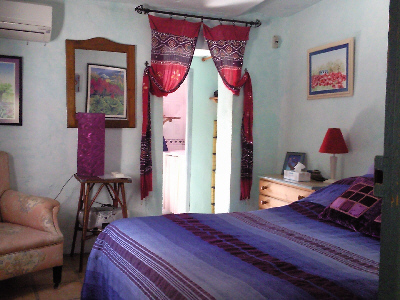 El Nido is comfortable for 2 to 5 people with its own private pool and private entrance leading into the fenced garden. We do accept pets but please inform us before you arrive. 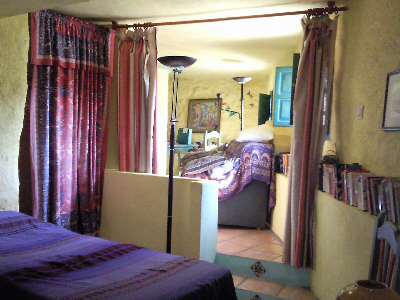 first floor bedroom has a double bed and its own bathroom (with bath/shower, basin, bidet, WC. heated towel rail and heater). Air conditioning. The kitchen is well equipped and has a double sink, 4 burner gas hob, electric oven, fridge & breakfast table, ironing facilities. See inventory for more details. 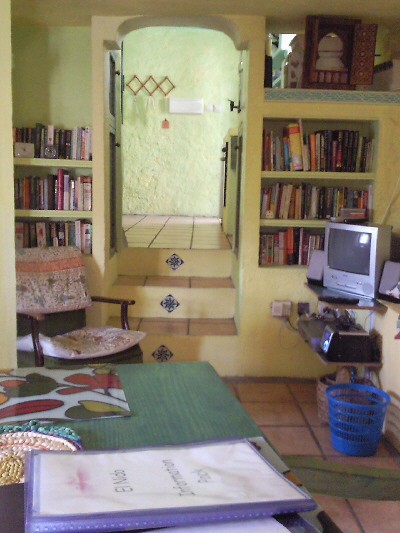 The dining room/sitting room has dining table and four chairs, settee, CD player with MP3 player socket, TV/DVD with Spanish channels and a large book collection. The sunken sitting room has settee/divan beds, Z bed and its own WC & shower room. Water is heated by a solar powered water heater with immersion backup. The building has well insulated walls & roofs & through ventilation, mains electricity & good piped water, tiled floors with rugs, internet connection installed. Linen & towels, including beach towels, are provided and an information file about the area, restaurants and walks. Outside an irrigation stream gurgles past the entrance gate. 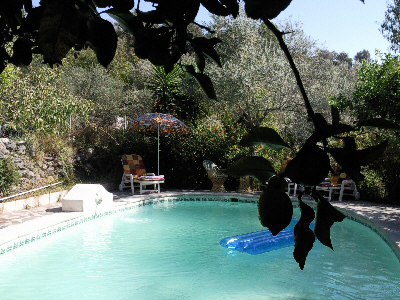 Amongst olive, orange and lemon trees is a sheltered patio with a BBQ, sun loungers around the pool and plenty of private areas to sit or you can lie in the hammock under the trees. When not exploring this wonderful region, you can swim in the enchanting pool, approx.10m x 5m with a gentle slope so excellent for non-swimmers and children. Clare and Ainsley look after El Nido and will be pleased to provide assistance if you need anything. Clare Sasada and Ainsley Platt have sucessfully run El Nido since 2001.Clare has been living in the area for over 25 years, Ainsley is now in his 20th year living in Orgiva. Clare travelled to Spain and started and ran a sucessful wholefood shop for more than 10 years.Wanting a change of direction she trained in Spain as a reflexologist and a foot health practitioner. The wholefood shop is now in the centre of Orgiva still trading as a well established business. Clare now works from home and also at a yoga retreat centre as a therapist as well as running a successful foot health business in the UK. Ainsley moved to Spain for a change of life which he got and is a superb artist and chef and spends his time at home looking after El Nido and catering for the guests. A Meal on arrival is always a good choice. A number of well qualified therapists are on hand to give a variety of treatments from thai yoga massage,reflexology, acupuncture and various other treatments. We also have regular yoga classes within a 5 minute walk away with Brenda Blades, a very well known yoga teacher. If you need help getting to el nido we can arrange an airport pickup too. 1st October 2017 to 31st of March 2018 £425 per week or 500 euros. 1st April 2018 to 30th September 2018 £575 per week or 700 euros. 1st October 2018 to end of year £425 per week or 500 euros. Then post booking confirmation with sterling cheque for non-returnable deposit of £100 per week to The Grange, Walcot Green, Diss, Norfolk. IP22 5SS. Cheque to be made out to Clare Sasada. Balance (non returnable within a month of your visit) to be paid by cheque no later than one calendar month before arrival. Direct bank transfer also accepted and paypal. When we confirm your reservation on receipt of deposit, we will send you details of 'how to find us'. On arrival, the information pack provides details of the locality, touring and walks. Also wine, beer & basic supplies are provided. 10.00 hrs local time on last day of your stay. El Nido is close to Orgiva, only a short walk to the shops, bars, restaurants, bus station etc. Non car users will find its location very amenable, also Clare and Ainsley are available for transport if needed to and from the airport and for day trips. To enjoy the region by car, we recommend pre-booking for easy pick up at Malaga or Granada airport. It is also possible to fly to Granada via Madrid or Barcelona & now direct from London city airport. This is less than an hour away. From Malaga airport it is 140 km along coast road and takes one and a half hours. You can drive from a channel port with a one-night stopover near border. There are also car ferries to Bilbao & Santander - a 24hr-boat trip & long days drive via Madrid & Granada. Orgiva is at the heart of LAS ALPUJARRAS, the beautiful valleys and foothills between the Sierra Nevada and the coastal range. Of great interest to walkers, birdwatchers, botanists, writers & painters or just for a great holiday away from it all. Click for more Photos of el nido. hang gliding, golf and skiing. their Berber villages dot the mountainsides. The nearest beach is 35 minutes away and the ski slopes 95 minutes.